The first person to talk to me about Turning Tables was my social worker where I live. In Afghanistan, I would have probably never started a job in gastronomy. But here in Germany, I had played with the thought of becoming a chef for quite a while. I like to cook, especially traditional, Afghan meals like Biryani or Bolani. My mum taught me the recipes when I was a kid. This is a time I will never forget. Food allows me to connect the culture of my home country with my host country, and share and enjoy it together with others. When my social worker told me about Step-IN, a program that would prepare me for a job in which I could follow my passion for food and cooking every day – I was instantly interested. As I didn’t have any real idea about German gastronomy, I signed up for the program without any real expectations. I just wanted to learn something new, inform myself give it a go. My plan was to just go there, do my best and see what would happen. As it turned out, that was the best decision ever! In less than three months I have learned so much, got so many insights into so many different areas of gastronomy and found so many new friends. I also noticed quite quickly that there was something that I was even more interested in than in cooking, the hotel industry! I love to be in touch with people and I feel even more comfortable working in service than I do in the kitchen. Before my time at Turning Tables, I didn’t even know that an apprenticeship as a hotelier was a thing! In my home country it doesn’t exist. But now, I cannot wait to learn everything about this job. 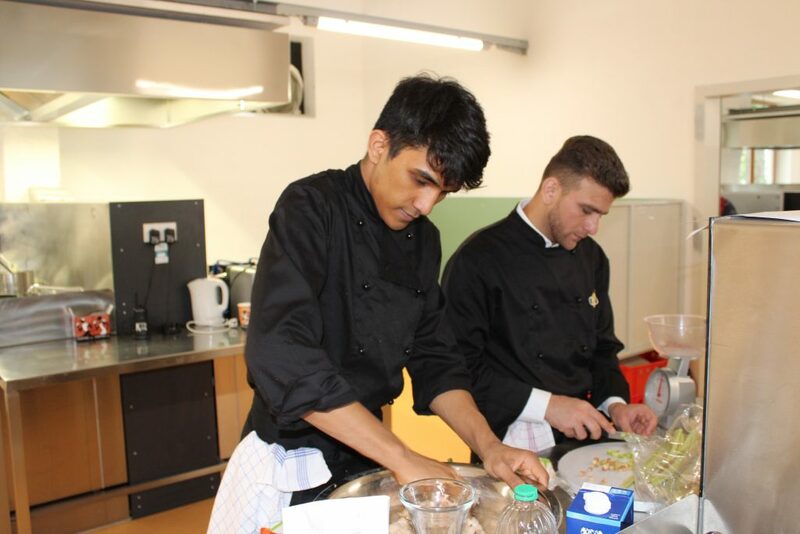 Whether it may be as a trainee, a young adult or a member of a multicultural society, Turning Tables has brought me forward in so many areas of my life. They gave me the little push that I needed to go in the right direction and enabled me to start this new chapter. In summer, we also had classes outside. This was a fun German class. The Step-IN program started in June 2018. 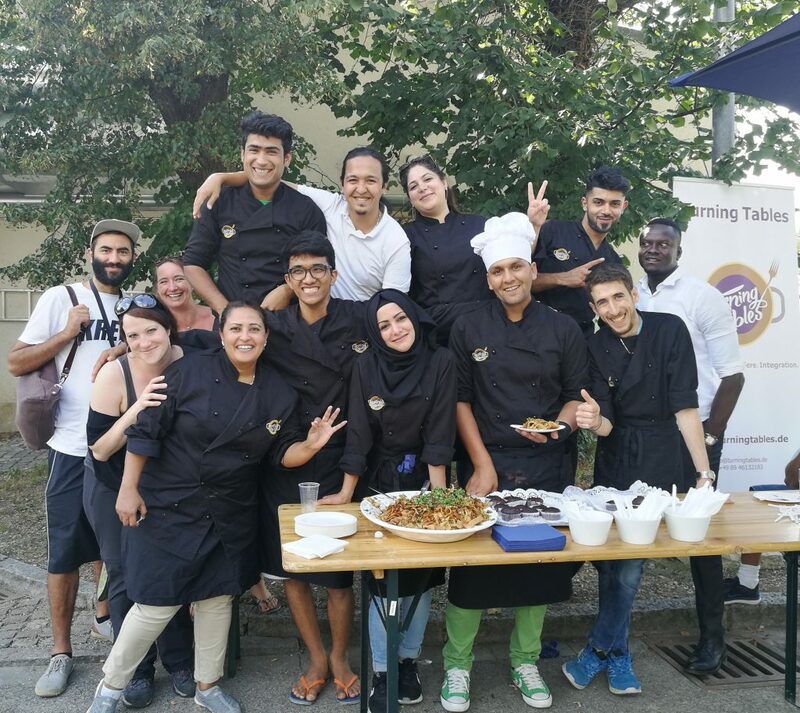 For refugees, not only the language but also cultural differences can be a challenge during the traineeship, especially vocational school. Thanks to the theoretical classes during the program, I feel like I will start this time well prepared. We got taught by Mrs Herman, who is a certified examiner for gastronomy apprenticeships. She knows exactly how vocational school works and has a lot of experience teaching. The syllabus we followed in Step-IN was created according to the syllabus they follow in the first year of vocational school. I was very happy about this procedure, as there were loads of things that I had never ever heard of before. One example is environmental protection. In Germany people attach importance on separating waste, in Afghanistan no one even bothers to think about it. There you put everything into one bag, then you throw it out of the window or place it in front of your neighbour’s door. If I had written this in my first exam, I probably would have not ended up with a very high score. But Mrs Herman told us much about this topic, the consequences and problems, and made sure that everyone understood. It was like this with many other important subjects, just like hygiene regulations, work security and guest interaction. During the introduction days at my apprenticeship with Hilton, I was the only one of 16 trainees who knew what “Mise en place” was, noticing what an advantage it had been to take part of Step-IN. I was really proud to be able to make a good impression. It felt good to prove from the beginning on, how serious I am about this apprenticeship. During the program, I also learned about things that went beyond technical matters. An important insight that I got was that every person is different. That origin, age and religion do not matter. As a refugee, you sometimes feel treated differently or even categorized. Unfortunately, I have also experienced that some people have prejudices or are not interest to get to know me, but I think that’s because they are afraid of the unknown. Still, that scares me a little sometimes, so I often keep to myself. Step-IN was the first time that I had regular contact with other people again – even with many Germans. The participants came from different countries all over the world: Syria, Iran, Eritrea, Senegal, Afghanistan. Although we were all different, had different backgrounds and stories, we got along very well from the start. There was not a single minute, that I felt lonely. Before Step-IN, I had a pretty bad image of Iranian people. I thought that they would all be like the ones that I struggled with, during my time in Iran. During Step-IN however, I met Nazy, a young Iranian woman, who understood me, respected me and became a really close friend. Through her, I realized that every person stands for themselves. Just how every refugee is different, every Syrian, Iranian or German person is different as well. Every human being has their own characteristics, and that’s a good thing, as it enables each and every one of us to contribute to a stronger, more colourful society.